Re-posting this since my previous post got closed as a duplicate, and the question they said it was a duplicate of does not fix my problem. I have a new-style group. Back when the new Facebook groups came out, I had the option to upgrade my old group, and I did so. I still have to approve member requests to join. It says '23 new members' and if I expand that, I see that members were added by other non-admin members. So people can be added to the group without having to be approved, but at the same time other people not in the group request to be added. I don't want to deal with these requests, I just want them auto-added. I have a Facebook group meant to be open for anyone to join. In the "edit group" screen, I set privacy to "open". There is a small lock icon besides the word "open", it that matters in any way. However, instead of "join" button, there is an "ask to join" button, and also apparently the group doesn't appear on searches (at least one person wasn't able to find it). How can I make my group actually open? Facebook does not provide a way to have groups that anyone can join instantly. Someone already in the group must add them, or they can request approval from a group admin. The likely reason for not providing this is that it would attract spammers. 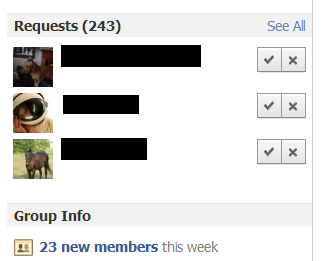 Old-style open groups had spam problems and they did not even have the new group notification or chat options. Unlike posting to a page, all group members are now notified by default of any new post to a group, and also for groups with no more than 250 members it is possible to send chat messages to all members of the group including people who are not confirmed friends. If you want anyone to be able to join and don't care about the notification or group chat features, then you may want to use a page rather than a group. Not the answer you're looking for? Browse other questions tagged facebook facebook-groups google-chrome-extensions automation userscripts or ask your own question. Will the old-style Facebook groups be converted to new-style Facebook groups?